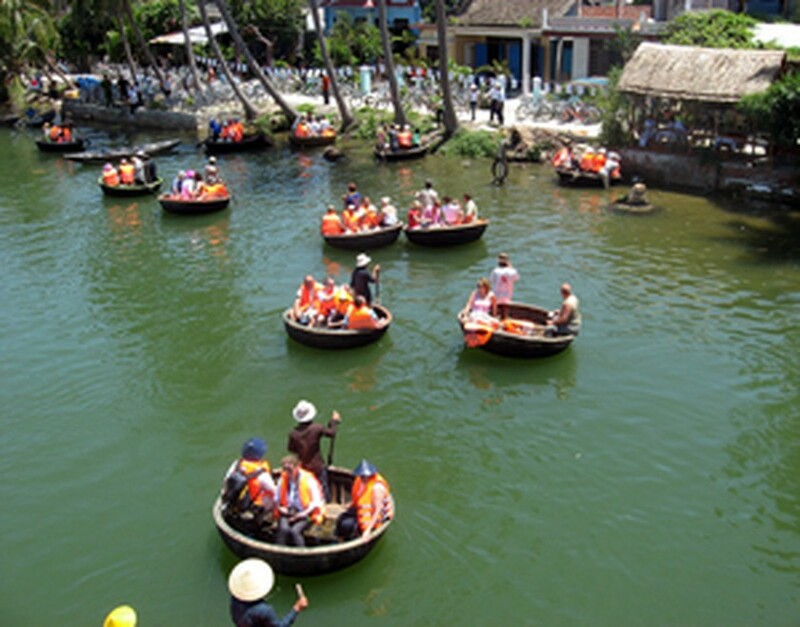 Hoi An, located in the central Viet Nam province of Quang Nam, sees its fair share of tours. Gaining particular attention is a recently opened Hoi An Eco-Tour, which combines ecological tourism with environmental protection, and it’s drawing in both local and foreign tourists. The director-come-tour guide of the Hoi An Eco-Tour is Tran Van Khoa, 29, whose family earns a living by fishing while he pursues a career in tourism. Born in Phuoc Hai fishing village, Khoa loves the Bay Mau coconut forest in which soldiers took shelter during war, contributing to the victories in the struggle against French and American armies. This love developed into an ambition to introduce his fatherland to the world. Now the tourists he guides can share his excitement, often walking away with exciting stories after watching the sunrise and sunset at Cua Dai (Big Gate) Sea and visiting Khoa’s favorite coconut forest. Welcoming us at Cua Hoi Ferry, Khoa’s boat then runs toward the Cua Dai Sea. As the day breaks, the only sound was the lull of the boat engine, and in the distance the sun looked like a round plate of fire as it rises over the waters into the milky sky. Many visitors have been struck by the beauty of this sight, touched by the early morning sunbeams as they watch the day begin. It is often surprising for people to realize just how fast the sun rises (though the more intently you try to track its rise, the harder it is to recognize its progress). Far away at the sea gate, fishermen were bringing in their first catches of the day. Sounds of their voices and laughter came closer and closer as fishing boats full of shrimp and fish, one after another, headed past us on their way back to shore. Their laughter echoed over the sea after a long shift of hard work. On wooden boats, tourists have a chance to join fishermen in their work, listen to stories about the Vietnamese soldiers’ lives and struggle for national independence, and listen to the region’s folk songs. When our boat came near a fishing boat from which a fisherman was getting ready to cast a net, Khoa explained to us that these were the nets that local fishermen used to catch shrimp and fish. Some of us wanted to try our hands at it, and with guidance from Khoa and the fisherman we managed to do it. Though we only caught a few clumps of seaweed, we were still happy to have learned a new skill. Soon, coracles from the boat set out to sea. Khoa said that these little vessels were used by fishermen to catch cuttlefish in the middle of the sea. After being taught the basic technique to row the coracles, tourists from our boat actually divided into groups for a “coracle race.” One couple tried their hardest but only managed to spin their coracle in place instead of moving, and everybody had a good laugh. For us, the race was not to determine winners and losers but instead was to help us relax and enjoy the sea after long days cooped up in the city. It also lent insight into the hard lives of Cua Dai fishermen, who must struggle with the sea every day to earn a living. Saying goodbye to Cua Dai fishing village and continuing on with our journey, we took the boat to Bay Mau coconut forest, a special zone (No. 80) for people and soldiers of Quang Nam during the anti-US resistance war. While the boat passed narrow canals amid green lines of coconut trees, Khoa told us about the heroic guerrillas of the Bay Mau forest. After a half hour of collecting rubbish in the forest, we enjoyed special seafood dishes cooked specially by Khoa’s mother, an excellent chef of traditional dishes. The tour group turned quiet as we watched the sun go down on the sea to leave the horizon dark purple – now is the time that the fishing boats would be returning to the sea. Fishing boats go out to sea again. Several tourists said that they had never previously paddled in the marshes, but all were willing to hop in up to their knees and wander in the marsh to contemplate the bunches of coconut flowers as they blazed like red torches in the vivid forest. Experiences like fishing and feeling a sense for the sea help stir visitors’ love for natural scenery and the residents of Hoi An. 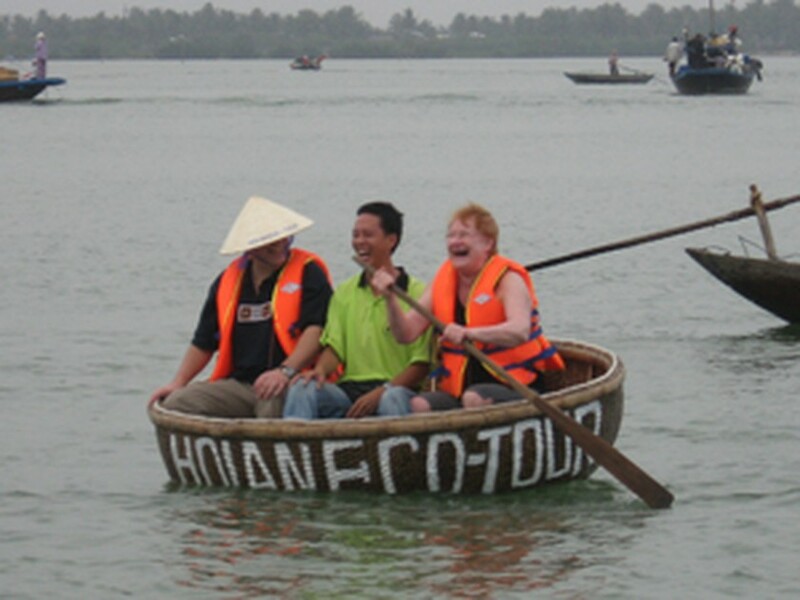 Hoi An Eco-Tour now attracts tourists from all corners of the world. The number continues to rise as Khoa improves the tour’s quality and provides new ones designed to accommodate tourists’ special needs – such as his “Happy Kid, Happy Parents” tour designed specially to include children. Recently the tour received the honor of being selected by Finnish president Tarja Halonen during her visit to Viet Nam in February. Most significantly, Khoa and his company strive to protect the environment. Every day when the tours conclude, Khoa diligently collects rubbish in the Bay Mau coconut forest, and also comes to each household in his village to encourage them not to dump their waste. With great effort and a love for tourism, Khoa has transformed the area into an ecological tourism region. Recently, he’s even persuaded locals to protect the wild birds in the forest. He also persuades tourists to participate in clearing rubbish in the coconut forest – everybody is willing to do it. Each September, Khoa encourages big hotels and inhabitants of Hoi An to participate in a “green day” to protect the environment. He wants tourists to understand the importance of protecting the environment. Khoa’s success has been praised widely around the world, as his smile has been featured in Business Traveler magazine, in praise of his great effort to preserve traditional value and protect the environment. “I hope with my tours, besides playing and enjoying Hoi An’s scenery, tourists will have a chance to learn about its history and culture,” he says.